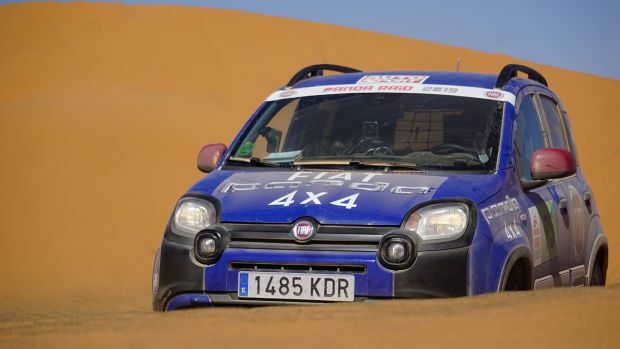 The Panda Raid rally is reserved for 4x2 and 4x4 Panda cars made prior to 2003 had its 11 edition this year, and quickly became a classic on the Rally Raid calendar. This year’s edition saw 400 vintage Pandas from around the world cross the starting line in Madrid, to cover over 3000 kilometres! The rally goes from Madrid to Marrakesh. Taking on terrains that would’ve been a tough challenge for majority larger off-roaders, the Fiat was unstoppable and proved once again how at ease it can be in villages, cities and sandy courses. Vintage cars joined the current Fiat Panda Cross 4x4 with 0.9 TwinAir Turbo engine and covered the route with confidence, even aiding to the rescue of some of the veterans. Since 1980, with over 7.5 million motorists in Europe choosing the brand, the Fiat manifesto has been “freedom on four wheels”, and this shone through between past and present Panda models. The iconic caravan left Madrid on 8 March and headed towards the coast and the port of Motril, embarking on a ferry ride to Mohamed V Dam in Morocco. This is where the true test of strength came out, with desert trails & sandy patches and endless landscapes surrounding, touching the towns of Bel-Frissate, Maadid, Merzouga, Tazoulait and Tansikht. The rally drew to a close on 15 March in the beautiful Marrakesh. The champion of the desert, the current Panda Cross 4x4 and the successor of the iconic Panda 4x4 launched 35 years ago is a legend in the locals’ eyes. The champion vehicle combines the traction system obstacle of a true off-roader with the agility of a city car to overcome any obstacle. This is courtesy of the extra 2.0 centimetres ground clearance than the 4x2 model, and its ability of an approach angle of 24°, a breakover angle of 21° and a departure angle of 34°. The driving behaviour is made possible by a permanent all-wheel drive system that was first introduced by Panda, as well as Drive Mode Selector that offers three different driving settings (Auto, Off-Road, and Gravity Control). The ‘Auto’ mode allows the Panda Cross 4x4 to act like a front wheel drive car where the rear wheels only receive more traction when needed. In the ‘Off-Road’ mode the torque is evenly distributed across all four wheels and force is transferred to the wheels with the most grip on the ground by Electric Locking Differential. And in the ‘Gravity Control’ mode, the system maintains optimum control of the vehicle by acting on the brakes on steeper descents. For the past 15 years, the Panda has been the best-selling city car in Europe as well as the undisputed leader in Italy since 2012, and the success of the Panda Rally 2019 backs this up. The Panda boasts a lot of firsts, including being the first city car with 4WD in 1983, and the first car in its segment to win the coveted ‘Car of The Year’ prize in 2004. It also happened to be the first city car to climb to an altitude of 5,200 metres to the Everest Base Camp in 2004. 2013 saw the first car in its class introduce autonomous emergency braking, and last the year Panda Waze, the most social Panda ever, was the star in Pandini at the largest Panda gathering of the world with 365 different cars from across Europe.